Please join us on Sunday 11 October at 12:00pm for Disney Live at the US Airways Center! Payment can be made by credit card, check, or cash. Prepare to laugh, sing and dance as you step into a world of wonder where wishing is only the beginning and dreams really do come true in Disney Live! presents Three Classic Fairy Tales Presented by Stonyfield YoKids Organic Yogurt. 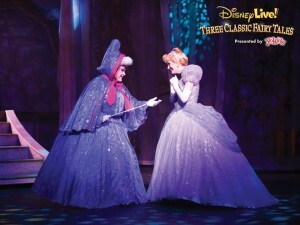 Join Mickey Mouse, Minnie Mouse, Donald and Goofy as they bring the timeless fairy tale adventures of Cinderella, Beauty and The Beast, and Snow White and the Seven Dwarfs to life in a live theatrical experience that is pure magic. With dynamic storytelling, award winning music, stunning costumes, glittering special effects and spectacular sets, you will be captivated by these spellbinding stories when you dream with the princesses and cheer for their heroes as they conquer evil villains. There is a world of enchantment waiting for you right in your hometown!